John Leguizamo proves that he is a graphic artist in "Latin History for Morons." Photos by Matthew Murphy. YOU paid your ticket, and honestly, it's on par with what Dr. X has been charging for your 50-minute hour. 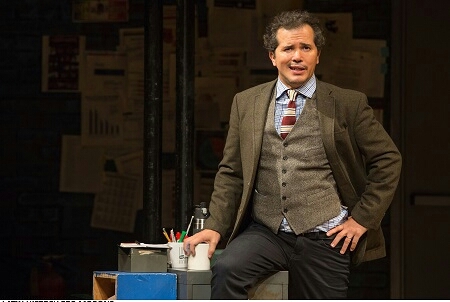 The question is whether John Leguizamo's Latin History for Morons, at Studio 54 in an extended run through 25 Feb. 2018, is your therapy or his? Either way, your 100 minutes give you more than your fair share of entertainment and food-for-thought. As is his wont, JL sprinkles intimate details amid quips and dance routines. He boasts, as is also his wont, of his street cred with something like a diffident bravado. He is a charmer. Director Tony Taccone could have tightened the pace a touch, but JL's observations are clever and wide-ranging: from the current sexual harassment charges pouring out of Hollywood, to politics, to centuries of oppression of Latinos. 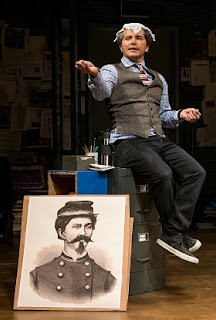 Rachel Hauck's classroom set centers on a large blackboard on which JL imparts the Latin history (Add graphic artist to his resume, which already includes stage star, screen actor and author). The artist has a catholic (with a small "c" – look it up) knowledge of the world, hence "Latin History for Morons" is quite illuminating. It is also heartfelt and heartwarming. 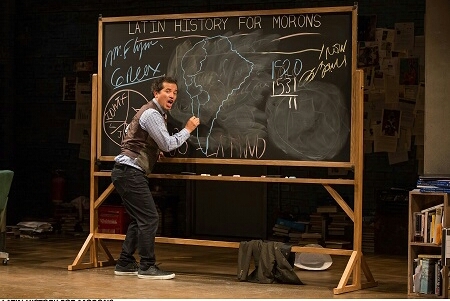 Visit https://www.latinhistorybroadway.com to learn the more about "Latin History for Morons." These custom essay help service are the beautiful photographs of the day. many courtiers were inspired by Buddhist rituals in the use of incense in temples and began burning incense at home.